Following the train crash earlier today in Northern Italy near to the town of Merano, close to the Austrian border, one of our photographers in Italy Alex Rowbotham who lives nearby, has asked me to publicise his images of both the inauguration of the line in 2005 and the landslide, crash scene and rescue operation currently in progress. 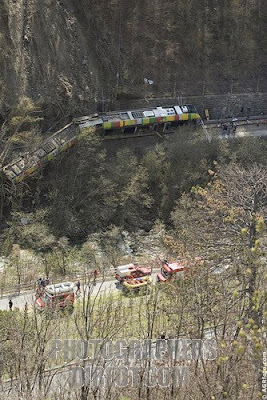 Alex's images of the train crash in Northern Italy, April 12 can be accessed here and Alex can be contacted directly by press agencies and the media by email. "Just after nine o'clock I heard the air-raid sirens that every village has at their fire stations. They sounded three times to signify there had been a major accident, usually a major road accident, a forest fire or house fire. They test these sirens each Saturday at midday so to hear them at any other time gives me the shivers. Now I'm down at the crash site, I can see the train cab is not there at all and the train is hanging off the rails about five metres from the river. It is now only a few trees that are holding up the train and preventing it falling into the river. The landslide looks like it happened on a bend. There would have been no way the driver could have seen it. The train is on the wrong side of the river to get equipment to the site by the main road, so the cycle path along the river has been opened up to vehicles. Workers there are trying to build a pontoon across the river in order to get equipment over. The main road was closed but is now open, although traffic is extremely heavy. There are a lot of fire fighters and ambulances coming and going but it looks like they have managed to get everyone out. The emergency services have to be praised. Many of them are volunteers from the local communities and they are doing an incredible job with precision and total control. The width of the landslide is about the length of a train carriage and it looks like it happened just after a bend. There would have been no way the driver could have seen it." UPDATE: Alex has added a set of new images of the rescue operation taken on site today, 13th April.